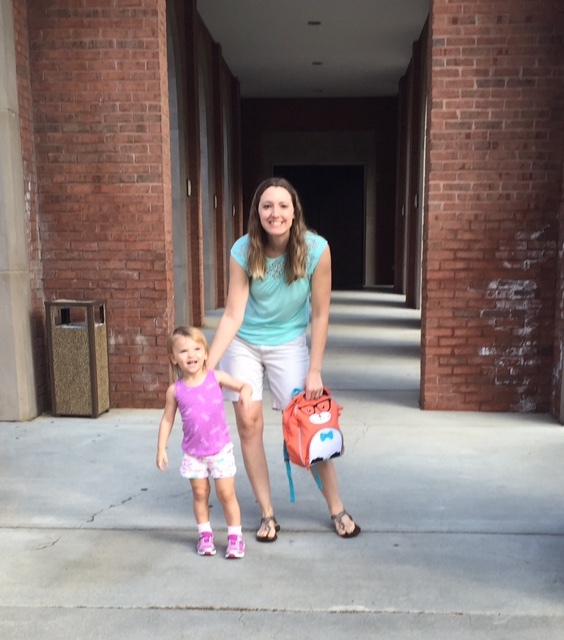 Fiona started her first week of day school this week! She did fantastic!!! Her class has 12 kids (2 year olds) on Tues and Thurs mornings. 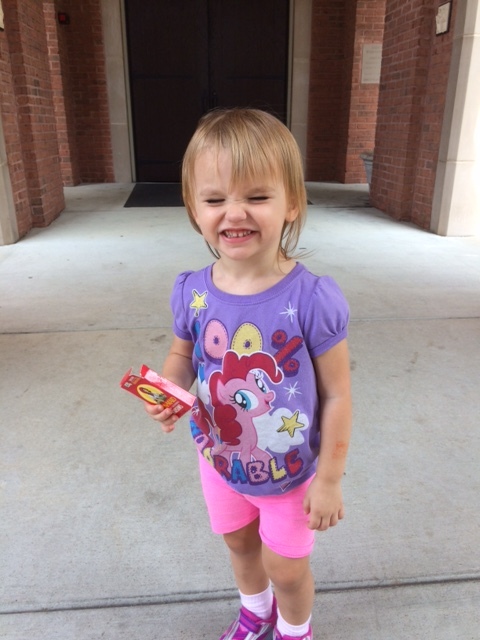 The 2 year olds in her class are typical hearing (which basically means they were born with normal hearing and don’t have hearing aids or cochlear implants). There are two teachers in her class whom I absolutely love. Tuesday was just a transition day with 5 kids and for only an hour. But today she was there for the full 3 1/2 hours. She cried a little at the beginning but did fantastic the rest of the day. Her favorite parts of the day were the slide at recess and the ukulele in music class. 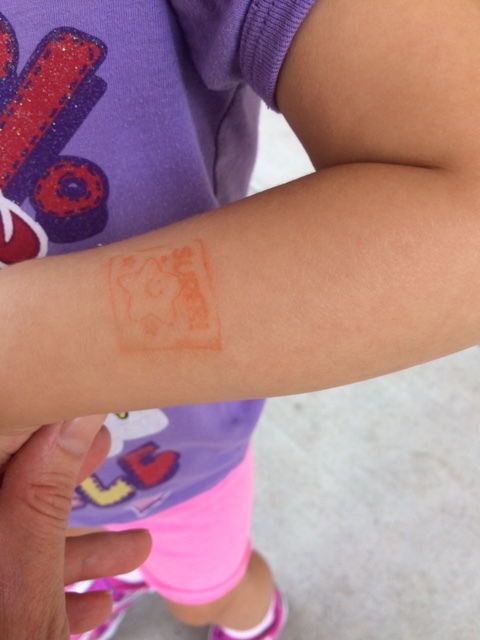 Her stamp that she showed me immediately. She’s never used “my” before another word before. I’m not surprised she is picking up a possessive pronoun from two year olds! I’m so excited that Fiona is going to learn so much from school. Especially new speech skills! Also, there were no cochlear implant issues all morning. She didn’t seem overwhelmed by all of the little kid’s noises. She acted like any other 2 year old would in this situation. It makes me feel a little relieved in knowing that just because she has cochlear implants doesn’t mean she can’t feel like a typical kid. 🙂 Anyways, we are so proud and excited for her. This entry was posted in Ramblings on September 10, 2015 by Eliza Isham. Man do kids love the game peek-a-boo! Here’s a video of Fiona playing peek-a-boo with her most favorite friend ever, “doggy’. I know, the name is so clever! I think its so cute how she says peek-a-boo. This entry was posted in Ramblings on August 16, 2015 by Eliza Isham. I wanted to share a preview of an incredible documentary that has been in the making for 7 years now. It’s the only film made that follows the journey of a profoundly deaf little girl until she’s 6 years old and has perfect speech. It follows two families of deaf children. The 1st family has deaf parents who chose to implant their deaf children as babies. The 2nd family has hearing parents who chose not to implant their daughter as a baby but immersed her in the language of ASL. You may of heard the mom’s name before – Rachel Coleman, the creator of the kids show “Signing Time”. Her daughter Leah chose to get implanted at the age of 6. The director has self funded this project so far but the very last part of clearing rights and licensing was more expensive then he planned. He has 10 days left to raise $16,000 in order to fund the rest of his project. I just pledged $25 and will get a digital download of the finished film. If you’d like to see the film be completed feel free to donate on this kickstarter link! Anyways the film looks incredible and I hope we get to see the finished product. This entry was posted in Ramblings on July 27, 2015 by Eliza Isham. This entry was posted in Ramblings on July 20, 2015 by Eliza Isham. Here are a few videos that I have to share. Sorry for the quality and lighting. Fiona loves to sing the bye bye song when she walks up the stairs. Here she is singing to daddy. Daddy goes by “haha.” I think that is a very appropriate name. 🙂 The singing while walking up the stairs makes me think of the Von Trapp kids. Here is a video of Fiona having a conversation on the phone and ignoring her mom. I think its pretty entertaining and it shows her more sophisticated type of babbling that she does now. She does this chitter chatter all day but usually a lot louder and with a lot more energy. 🙂 You’ll notice her very fancy night time neoprene pack thats attached to her shirt. Fiona used to sleep without her processors on. Then a month ago she started asking for them at night time. I think it might be too scary having that sound taken away at night. So we let her sleep with one and alternate sides throughout the week. This entry was posted in Ramblings on June 3, 2015 by Eliza Isham. This entry was posted in Ramblings on May 18, 2015 by Eliza Isham.